« How should Christians stand up for their faith in such an anti-Christian world? According to a Defense Department-approved “sexism course,” the Bible, the U.S. Constitution and the Declaration of Independence all contribute to modern sexism. According to the course, the Bible has “quotes” which can be interpreted as sexist by readers. “The content of the lesson is provided to generate academic discussion concerning how these historical documents have been included in discussions about the topic of sexism,” Lt. Cmdr. Nate Christensen, a Defense Department spokesman, told The Daily Caller. 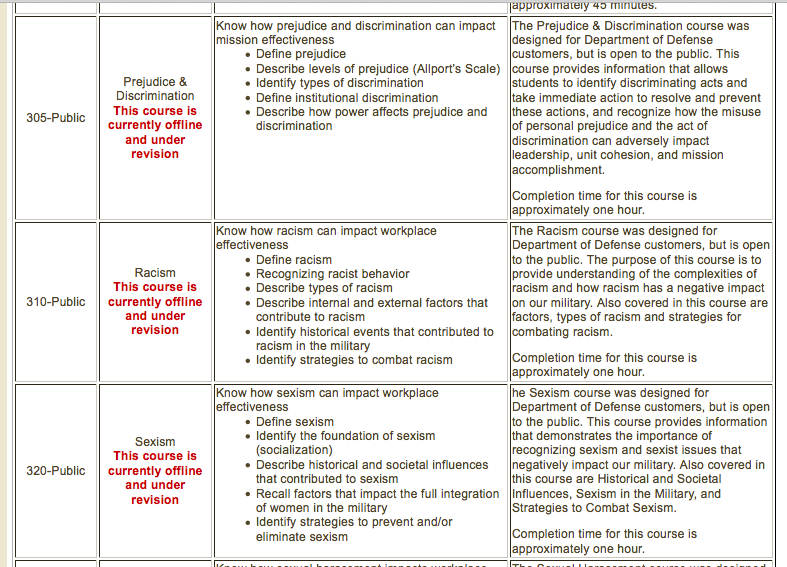 But following TheDC’s request for comment, the sexism course — as well as two other courses listed on DEOMI’s website, entitled “Prejudice & Discrimination” and “Racism” — were taken offline. “This course is currently offline and under revision,” a notice says under all three courses.